Jiroemon Kimura from Japan, who was recognized as the world’s oldest living person, and the oldest man recorded in history, has died aged 116, local officials say. Jiroemon Kimura died of natural causes on Wednesday in a hospital in Kyotango, Kyoto, a government statement said. In December, Guinness World Records recorded Jiroemon Kimura as the oldest man ever verified to have lived. He reportedly had seven children, 14 grandchildren, 25 great-grandchildren, and 13 great-great-grandchildren. Jiroemon Kimura was born on 19 April 1897, the same year as aviator Amelia Earhart. He worked in his local post office until retiring and was said to have helped his son with his farming until he was around 90 years old. 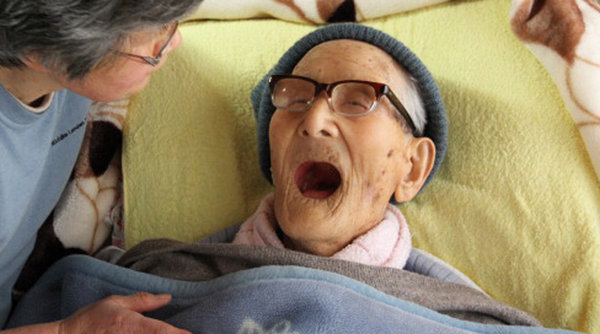 Jiroemon Kimura became the world’s oldest living person in December, when the previous title-holder died. In an interview in December, his nephew, Tamotsu Miyake, said Kimura had “an amazingly strong will to live”. In an interview on his 115th birthday, Jiroemon Kimura said he was not sure why he was able to live so long. “Maybe it’s all thanks to the sun above me,” he said. Journalist Kanoko Matsuyama of Bloomberg News met Jiroemon Kimura at his home last year. “He said his secret to his longevity was eating light to live long,” said Tamotsu Matsuyama. Japanese woman Misao Okawa from Osaka, who is 115 years old, will most probably inherit the title of world’s oldest living person, reports say. Misao Okawa is already considered the world’s oldest living woman.